The Blaine County School District could face a loss of $29.5 million in funding due to proposed state legislation that would remove its ability to automatically collect funds from county property taxes. Losing this funding would be "devastating," said Lonnie Barber, district superintendent. "I can't think of any good scenarios that can come out of it," Barber said during a school board meeting on Wednesday. Currently, the district can collect $29.5 million through a permanent levy on county property taxes. A bill now in the Idaho House Revenue and Taxation Committee would require the district to ask for voter approval of this levy every two years, as it does its supplemental levies. 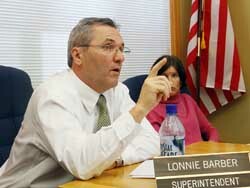 Even if the voters did approve a levy, the vote itself would create an extraordinary amount of uncertainty, Barber said. The district would not know from election to election whether it would receive nearly 60 percent of its operating budget. Rep. Wendy Jaquet, D-Ketchum, said she is opposed to the bill because of the impact it would have on teachers. "It's going to create some anxiety," she said. The district's 2011 budget allots $41 million for staffing, with $29.5 million for salaries alone. Staffing makes up roughly 74 percent of the district's expenses from the general fund. District Business Manager Mike Chatterton agreed that staff would bear the brunt of lost funding. "It would affect every position in the district," he said. But Chatterton said programs would suffer as well, and newer programs such as dual immersion and the International Baccalaureate courses would be most likely to go on the chopping block. Chatterton said the impacts of losing the majority of general funds would be widespread and pervasive. "It would affect all of our programming," he said. "Every decision we would make would be determined on that supplemental levy." According to the bill's attached note, elimination of the levy would have no impact on the state's budget. If county voters choose not to approve a levy, the money would simply not be collected, lowering overall property tax. The bill was introduced in committee Wednesday by Rep. Dennis Lake, R-Blackfoot. However, Jaquet said that Rep. Ken Roberts, R- Donnelly, had been working on this legislation for years. The bill stems from another passed in 2006, the Property Tax Relief Act. That act shifted school district funding in much of the state from county property taxes to state income and sales tax. "A lot of people were really upset about their property taxes, and we were looking for property-tax relief," Jaquet said. Jaquet said Blaine and three other districts were provided with an exemption because they were not receiving much funding from the state due to high property values in those areas. The exemption guaranteed these four districts would retain a consistent level of funding. However, Jaquet said the Legislature is about to back out on its commitment to the districts. "The Legislature is reneging on a promise," she said. "Roberts and the others are there for the taxpayers and not educational excellence." Chatterton also showed a sense of betrayal regarding the proposed legislation. "[The bill] is exactly the opposite of what the Legislature promised us five years ago," he said. Jaquet said she is confident that even if the district had to ask voters to approve the levy every few years, voters would support the district. "The patrons have spoken," she said, by already supporting the district's "extraordinary and exceptional" schools. Chatterton said he hopes the district could count on continued voter support. "The School District was built on what the district has asked us to do," he said. "I would think the community would still be willing to support us." If not, Chatterton said, the district would be faced with tough choices. "It would be hard to imagine the impact of eliminating 60 percent of the (operating) budget for the district," he said. The House committee has yet to hold a hearing on the bill. If approved, it would have to be passed by both the House and the Senate and signed by Gov. Butch Otter before it becomes law. Barber said he and the district would continue to lobby against the bill, and that he would testify in front of the Legislature during the next few weeks. "We won't go down without a fight," he said.